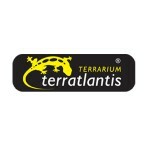 Terratlantis manufactures terrariums, furniture and accessories, offering a wide range of products to its customers. Specialised in reptile and amphibian care, the brand stands out for the elegance present in all lines and the high quality of materials used. Terrariums are made of float glass with durable and resilient aluminum structures. They also feature padlock enclosures to ensure security and prevent escape, as well as lighting systems adapted to terrariums and a wide range of bulbs.